RAM stands for Random Access Memory, and it gives computers the virtual space needed to manage information and solve problems in the moment. You can think of it like reusable scratch paper that you would write notes, numbers, or drawings on with a pencil. If you run out of room on the paper, you make more by erasing what you no longer need; RAM behaves similarly when it needs more space to deal with temporary information (i.e. running software/programs). Larger pieces of paper allow you to scribble out more (and bigger) ideas at a time before having to erase; more RAM inside of computers shares a similar effect. One of the two basic memory types (the other being DRAM), SRAM requires a constant power flow in order to function. Because of the continuous power, SRAM doesn’t need to be ‘refreshed’ to remember the data being stored. This is why SRAM is called ‘static’ – no change or action (e.g. refreshing) is needed to keep data intact. However, SRAM is a volatile memory, which means that all the data that had been stored becomes lost once the power is cut off. One of the two basic memory types (the other being SRAM), DRAM requires a periodic ‘refresh’ of power in order to function. The capacitors that store data in DRAM gradually discharge energy; no energy means the data becomes lost. This is why DRAM is called ‘dynamic’ — constant change or action (e.g. refreshing) is needed to keep data intact. DRAM is also a volatile memory, which means that all the stored data becomes lost once the power is cut off. In the 1990s, Extended Data Out Dynamic RAM (EDO DRAM) was developed, followed by its evolution, Burst EDO RAM (BEDO DRAM). These memory types had appeal due to increased performance/efficiency at lower costs. However, the technology was rendered obsolete by the development of SDRAM. SDRAM is a classification of DRAM that operates in sync with the CPU clock, which means that it waits for the clock signal before responding to data input (e.g. user interface). By contrast, DRAM is asynchronous, which means it responds immediately to data input. But the benefit of synchronous operation is that a CPU can process overlapping instructions in parallel, also known as ‘pipelining’ — the ability to receive (read) a new instruction before the previous instruction has been fully resolved (write). Although pipelining doesn’t affect the time it takes to process instructions, it does allow more instructions to be completed simultaneously. Processing one read and one write instruction per clock cycle results in higher overall CPU transfer/performance rates. 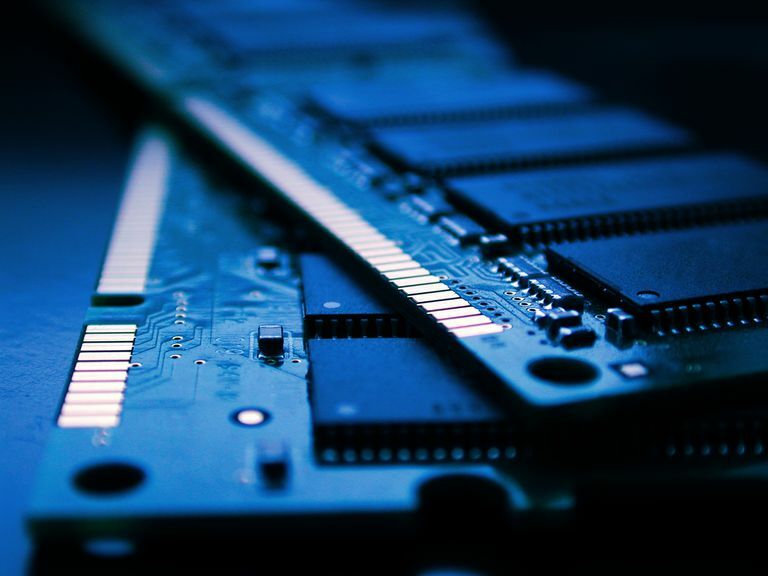 SDRAM supports pipelining due to the way its memory is divided into separate banks, which is what led to its widespread preference over basic DRAM. DDR SDRAM operates like SDR SDRAM, only twice as fast. DDR SDRAM is capable of processing two read and two write instructions per clock cycle (hence the ‘double’). Although similar in function, DDR SDRAM has physical differences (184 pins and a single notch on the connector) versus SDR SDRAM (168 pins and two notches on the connector). DDR SDRAM also works at a lower standard voltage (2.5 V from 3.3 V), preventing backward compatibility with SDR SDRAM. DDR2 SDRAM is the evolutionary upgrade to DDR SDRAM. While still double data rate (processing two read and two write instructions per clock cycle), DDR2 SDRAM is faster because it can run at higher clock speeds. Standard (not overclocked) DDR memory modules top out at 200 MHz, whereas standard DDR2 memory modules top out at 533 MHz. DDR2 SDRAM runs at a lower voltage (1.8 V) with more pins (240), which prevents backward compatibility. DDR3 SDRAM improves performance over DDR2 SDRAM through advanced signal processing (reliability), greater memory capacity, lower power consumption (1.5 V), and higher standard clock speeds (up to 800 Mhz). Although DDR3 SDRAM shares the same number of pins as DDR2 SDRAM (240), all other aspects prevent backward compatibility. DDR4 SDRAM improves performance over DDR3 SDRAM through more advanced signal processing (reliability), even greater memory capacity, even lower power consumption (1.2 V), and higher standard clock speeds (up to 1600 Mhz). DDR4 SDRAM uses a 288-pin configuration, which also prevents backward compatibility. GDDR SDRAM is a type of DDR SDRAM that is specifically designed for video graphics rendering, typically in conjunction with a dedicated GPU (graphics processing unit) on a video card. Modern PC games are known to push the envelope with incredibly realistic high-definition environments, often requiring hefty system specs and the best video card hardware in order to play (especially when using 720p or 1080p high-resolution displays). Similar to DDR SDRAM, GDDR SDRAM has its own evolutionary line (improving performance and lowering power consumption): GDDR2 SDRAM, GDDR3 SDRAM, GDDR4 SDRAM, and GDDR5 SDRAM. Despite sharing very similar characteristics with DDR SDRAM, GDDR SDRAM is not exactly the same. There are notable differences with the way GDDR SDRAM operates, particularly regarding how bandwidth is favored over latency. GDDR SDRAM is expected to process massive amounts of data (bandwidth), but not necessarily at the fastest speeds (latency) – think of a 16-lane highway set at 55 MPH. Comparatively, DDR SDRAM is expected to have low latency to immediately respond to the CPU – think of a 2-lane highway set at 85 MPH.